The advantage of root canal treatment (RCT) is that you can preserve your natural tooth even when decay has compromised the tooth. This allows you to avoid extraction which often requires a solution to fill the gap. We are equipped with high powered operating microscopes, usually only at the disposal of endodontists, allowing us to perform treatment with great precision. We recommend regular check-ups and scale and cleans to prevent root canal treatments where possible. A damaged tooth that has inflammation of the pulp can be quite painful which is why we would refer you to our dentists for prompt treatment. We aim to relieve stress where possible. Root canal treatment involves removal of the inflamed tissue and procedure preparation to prevent bacteria from multiplying in the canal spaces. 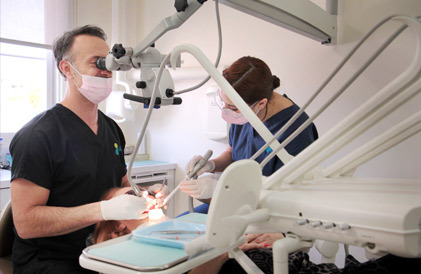 Our dentists recommend coming into the surgery straight away, if you have infected teeth, as the situation can worsen if the nerve or a blood vessel has disintegrated and bacteria has colonised the root canal system. This can lead to abscess formation where the bacteria sends toxins right into the jaw bone and can result in the loss of teeth and the need for dental implants. Are you concerned about root canal treatment? Contact us to learn more.